Sean John has created Video Fashion with Recom Group’s famous Video Name Tag exclusively in Select Macy’s Stores beginning the week of December 3rd, 2012. New York, NY/Los Angeles, CA (December 2, 2012) – Recom Group (www.VideoNameTag.com), Macy’s (www.macys.com), Sean John (www.seanjohn.com) . Sean John and Macy’s have teamed up with Recom Group’s innovative Video Name Tag to introduce the world’s first integration of video and fashion. Macy’s VP of Men’s Fashion, Durand Guion, first saw Recom’s technology at the Consumer Electronics Show in January of this year. It was the first time Recom had shown their technology incorporated in clothing. At the same show, a CNN Tech Report called Recom Group’s technology one of the 5 top innovations out of 20,000 new product introductions. 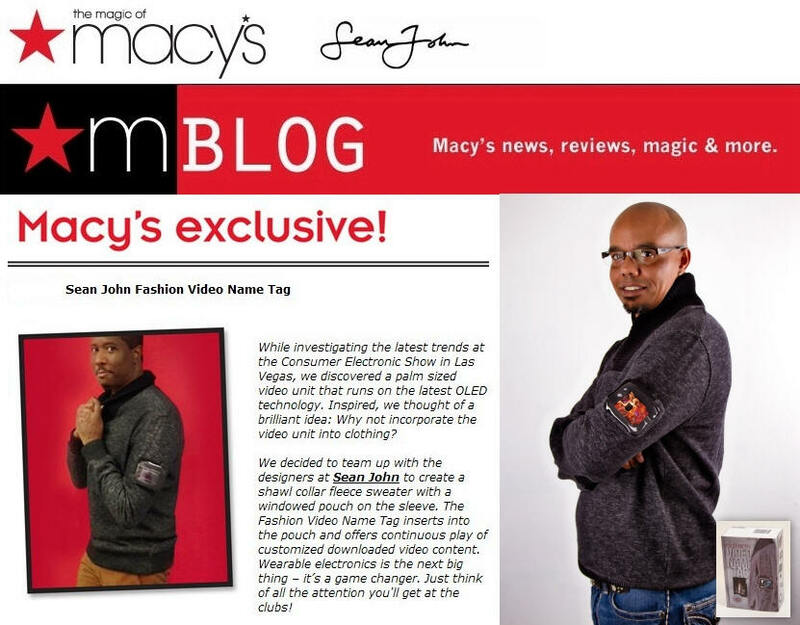 Macy’s Vice President, Guion, shares "We are excited to launch this creative combination of technology and fashion"
The sweater by Sean John is just the first of potentially many other garments they have designed to hold and display your own personal video screen. The sweater and fashion video name tag are available in a limited selection of Macy’s stores in major metropolitan markets. For a specific list of stores visit: www.RecomGroup.com/macys.htm . The Video Name Tag was first introduced at the Consumer Electronics Show in 2011. Since that time this product line has been used by and seen on CBS Television, NBC’s Today Show, ABC’s Broadcast of the NBA Finals, ABC’s Good Morning America and CNN’s coverage of both the Democratic and Republican National Conventions. It was used on Rihanna’s most recent World Tour. What started out as a promotional device for business and media has quickly become a hot new consumer product. Men’s Fashion Director Recom Group, Inc.